The IAU fully supports the involvement of the general public in the naming of astronomical objects, whether directly or through an independent organised vote, in the naming of planetary satellites, newly discovered exoplanets, and their host stars. This follows a well-established tradition for naming Solar System objects. The IAU does not consider itself as having a monopoly on the naming of celestial objects — anyone can in theory adopt names the way they choose. However, given the publicity and emotional investment associated with these discoveries, worldwide recognition is important and the IAU offers its unique experience for the benefit of a successful public naming process (which must remain distinct, as in the past, from the scientific designation issues). The scientific nomenclature for the designations of exoplanets usually consists of two elements: 1) a proper noun or abbreviation, sometimes with associated numbers 2) followed by a lowercase letter. The first element can derive from a number of sources. A common source is an exoplanet's host star's widely recognized, common or astronomical catalogue name. Alternatively, exoplanets are often named after the scientific instrument or project that discovered the exoplanet. We'll look at several examples of the first element of exoplanetary naming. 51 Pegasi b, for instance, is an exoplanet around the star 51 Pegasi in the constellation Pegasus. The star received this particular catalogue designation by English astronomer John Flamsteed in his 1712 star atlas. Another common star catalogue used for exoplanet names is GJ, from a 1970 expansion of German astronomer Wilhelm Gliese's 1957 index. (A handful of Gliese exoplanets also exist as well.) An example world with this naming is GJ 1214 b, meaning it is the 1,214th entry in the star catalogue. Still other examples include the HD and HIP exoplanets. An example of an exoplanet named after its star's common name is Fomalhaut b, derived from an Arabic name originally used at least 2,000 years ago. 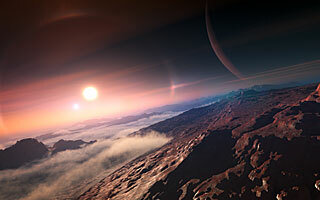 Exoplanets that are named after their discovering instrument include the Kepler planets, for the National Aeronautical and Space Administration's (NASA) Kepler space telescope. Another instance is the CoRoT planets, for the French Space Agency's (CNES) and the European Space Agency's (ESA) spacecraft, COnvection ROtation and planetary Transits. Example planets are Kepler-186 f and CoRoT-7b, respectively. The number in each name refers to the order of the exo-solar system's detection or identification in the instrument's data. Exoplanets that are named after astronomical or planet-searching projects include the HAT planets, via the Hungarian Automated Telescope Network (HATNet), and the WASP planets, from the SuperWASP project, both of which are ground-based efforts. Numerous other examples exist. The nation of Qatar funds an exoplanet-hunting project, and its planets follow the naming scheme of Qatar-1b, and so on. The MOA and OGLE exoplanets were discovered through a particular observation technique, called gravitational microlensing, by the Microlensing Observations in Astrophysics (MOA) and the Optical Gravitational Lensing Experiment (OGLE) projects, respectively. We'll now address the second letter element appearing in exoplanet scientific designations. Unlike the proper noun, the letter term applies universally in almost all nomenclature styles. The letter indicates the order of the planet's discovery around its host star. The first exoplanet discovered in another solar system is designated b; the second, c; the third d; and so on. The letter does not indicate the planet’s orbital placement around its host star, so Exoplanet-c can be closer to, or farther away from, the star that it co-orbits with Exoplanet-b. The lowercase lettering style is drawn from the IAU-established rules for naming binary and multiple star systems. A primary star, which is brighter and typically bigger than its secondary or tertiary companion stars, is designated by a capitalized A. Its companions are labelled B and C, and so on. Sirius, the brightest star in the sky, demonstrates this nomenclature. Actually a double star, the bright star we see in Canis Major is Sirius A, and its dim companion is Sirius B. The first exoplanet tentatively identified around the second brightest star in the triple star system, Alpha Centauri, is accordingly called Alpha Centauri Bb. If an exoplanet orbits both of the stars in a binary system, its name can be, for example, Kepler-34(AB) b. The public names proposed in naming campaign should follow the naming rules and restrictions adopted for Minor Bodies of the Solar System, by the IAU and by the Minor Planet Center (see https://www.iau.org/public/naming/#minorplanets, or, for more details, http://www.minorplanetcenter.net/iau/info/Astrometry.html#nametype). It is understood that, if a scientific designation for the object(s) already exists, the public name will not replace it, but will be recognized by the IAU as the appropriate publicly used name for the object(s), and be publicized as such, along with due credit to the organization or individual that proposed it. This public name may then be used internationally along with, or instead of, the scientific designation, permanently and without restrictions. IAU press release (iau1301): Can One Buy the Right to Name a Planet? Planet 42 Draconis b Orbitar Orbitar is a contrived word paying homage to the space launch and orbital operations of NASA. Planet 47 Ursae Majoris b Taphao Thong Taphao Thong is one of two sisters associated with the Thai folk tale of Chalawan. Planet 47 Ursae Majoris c Taphao Kaew Taphao Kae is one of two sisters associated with the Thai folk tale of Chalawan. Planet 51 Pegasi b Dimidium Dimidium is Latin for "half", referring to the planet's mass of at least half the mass of Jupiter. Planet 55 Cancri b Galileo Galileo Galilei (1564-1642) was an Italian astronomer and physicist often called the "father of observational astronomy" and the "father of modern physics". Using a telescope, he discovered the four largest satellites of Jupiter, and the reported the first telescopic observations of the phases of Venus, among other discoveries. Planet 55 Cancri c Brahe Tycho Brahe (1546-1601) was a Danish astronomer and nobleman who recorded accurate astronomical observations of the stars and planets. These observations were critical to Kepler's formulation of his three laws of planetary motion. Planet 55 Cancri e Janssen Jacharias Janssen (1580s-1630s) was a Dutch spectacle maker who is often attributed with invention of the microscope, and more controversially with the invention of the telescope. Planet 55 Cancri f Harriot Thomas Harriot (ca. 1560-1621) was an English astronomer, mathematician, ethnographer, and translator, who is attributed with the first drawing of the Moon through telescopic observations. Planet HD 104985 b Meztli Meztli was the Aztec goddess of the Moon. Planet HD 149026 b Smertrios Smertrios was a Gallic deity of war. Planet HD 81688 b Arkas Arkas was the son of Callisto (Ursa Major) in Greek mythology. Planet mu Arae b Quijote Lead fictional character from Cervantes's "El Ingenioso Hidalgo Don Quixote de la Mancha". Planet mu Arae c Dulcinea Fictional character and love interest of Don Quijote (or Quixote) in Cervantes's "El Ingenioso Hidalgo Don Quixote de la Mancha". Planet mu Arae d Rocinante Fictional horse of Don Quijote in Cervantes's "El Ingenioso Hidalgo Don Quixote de la Mancha". Planet mu Arae e Sancho Fictional squire of Don Quijote in Cervantes's "El Ingenioso Hidalgo Don Quixote de la Mancha". Planet PSR 1257+12 b Draugr Draugr refers to undead creatures in Norse mythology. Planet PSR 1257+12 c Poltergeist Poltergeist is an name for supernatural beings that create physical disturbences, from German for "noisy ghost". Planet PSR 1257+12 d Phobetor Phobetor is a Greek mythological deity of nightmares, the son of Nyx, the primordial deity of night. Planet upsilon Andromedae b Saffar Saffar is named for Abu al-Qasim Ahmed Ibn-Abd Allah Ibn-Omar al Ghafiqi Ibn-al-Saffar, who taught arithmetic, geometry, and astronomy in 11th century Cordova in Andalusia (modern Spain), and wrote an influential treatise on the uses of the astrolabe. Planet upsilon Andromedae c Samh Samh is named for Abu al-Qasim 'Asbagh ibn Muhammad ibn al-Samh al-Mahri (or "Ibn al-Samh"), a noted 11th century astronomer and mathematician in the school of al Majriti in Cordova (Andalusia, now modern Spain). Planet upsilon Andromedae d Majriti Majriti is named for Abu al-Qasim al-Qurtubi al-Majriti, a notable mathematician, astronomer, scholar, and teacher in 10th century and early 11th century Andalusia (modern Spain). Planet xi Aquilae b Fortitudo* Fortitudo is Latin for "fortitude". Fortitude means emotional and mental strength in the face of adversity, as embodied by the eagle (represented by the constellation Aquila). (*) Note: These names are modified based on the original proposals, to be consistent with the IAU rules. Note 1: The original name proposed, "Veritas", is that of an asteroid important for the study of the solar system. Note 2: The name originally proposed, Amaterasu, is already used for an asteroid. Note 3: Note the typographical difference between "AEgir" and "Aegir", the Norwegian transliteration. The same name, with the spelling "Aegir", has been attributed to one of Saturn's satellites, discovered in 2004. Note 4: "Ogmios" is a name already attributed to an asteroid. Note 5: The original proposed name "Leda" is already attributed to an asteroid and to one of Jupiter's satellites. The name "Althaea" is also attributed to an asteroid. Note 6: The original spelling of "Lippershey" was corrected to "Lipperhey" on 15.01.2016. The commonly seen spelling "Lippershey" (with an "s") results in fact from a typographical error dating back from 1831, thus should be avoided.